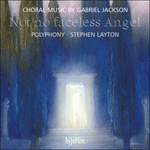 Gabriel Jackson began his musical training as a chorister at Canterbury Cathedral and later studied composition at the Royal College of Music. His music is now widely recorded, and regularly performed and broadcast around the world. Many of his pieces reflect an interest in mediaeval techniques and ideas, and are made of simple melodies, chords, drones, and ostinatos. The composer says, “I try to write music that is clean and clear in line, texture, and structure… [My pieces] are not about conflict and resolution; even when animated, they are essentially contemplative. I like repetition and ‘ritualised’ structures”. 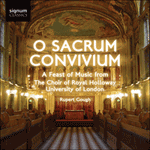 O sacrum convivium was commissioned (with funds provided by South East Arts) by Andrew Millington, then organist of Guildford Cathedral, for the 1990 Guildford and Portsmouth Cathedrals’ Festival. As the piece was to be sung by the combined forces of two cathedral choirs, Jackson decided to take advantage of the potentially massive resultant sonority by dividing the score, at some moments, into ten parts. The piece is predominantly quiet and meditative, with a refulgent climax at ‘et futurae gloriae’. O sacrum convivium is dedicated to the composer’s father, who was at that time a clergyman in the Guildford diocese.